About 3 years ago I started collecting vintage cookbooks to feed my hunger of “classic recipes” .. It’s intriguing.. the difference between cooking in early 1900’s and now. I even have one book from the late 1800’s.. which I just got and was a tad bit expensive but I’m an impulsive shopper and throw all reason out the window when I see something I want. Just ask American Express.. The book is called “The Virginia Housewife” by Mary Randolph,, it's great if you are cooking outside over an open hearth.. which I don’t. So I am trying to adapt some of these recipes to modern day 2012 but at times this has me re-thinking this purchase. I’m a sucker for the classics… most of the recipes that are my favorites have been past down through generations..
Like “Mama Katie's” Chocolate Cake. I really don’t remember Mama Katie well… but what I do remember, were warm and cozy hugs and her telling me the importance of remembering the Apostles Creed. My first slice of this chocolate cake was sitting in Mama Katie’s kitchen.. it was a rich and dark slice of cake that was baked in a bundt pan and sprinkled with powdered sugar..
Later, after learning the recipe.. I would see that it really was a basic Chocolate Cake recipe and wasn’t really Mama Katie's but I love it still the same. 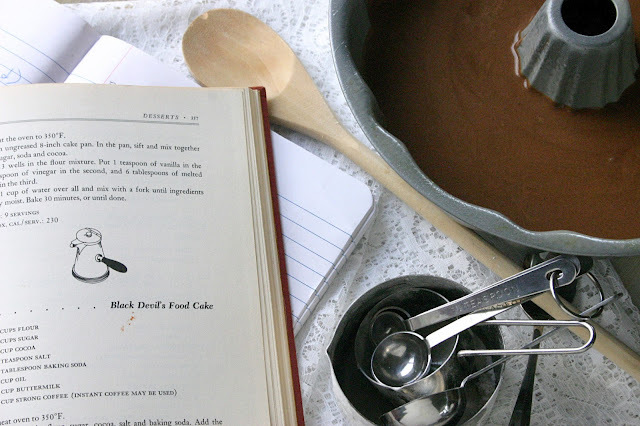 Tell me, what’s your favorite classic recipe? recipe adapted from "1973 American Heart Association Cookbook"
Heat oven to 350. Prepare cake pan (bundt pan) by greasing with cooking spray. In a medium bowl, add hot coffee and cocoa powder and stir until dissolves. Stir in brown sugar, yogurt and vanilla until all ingredients are incorporated. In a separate bowl of an electric mixer, beat butter and granulated sugar until light and fluffy, about 2 minutes. Scrape down the sides of the bowl as needed. Add eggs and mix for another 2 minutes. Sift together flour, baking soda and salt in a bowl, then with the mixing on low speed, mix in the flour mixture, then coffee mixture. Mixing until all ingredients are fully incorporated. Pour batter into prepared cake pan and bake at 350 for 25 minutes then rotate pan and bake for another 25 minutes. Test cake (using cake tester or toothpick) by inserting in the center of cake and the tester comes out clean. Allow cake to cool, then turn out onto plate. Then sprinkle with powdered sugar.